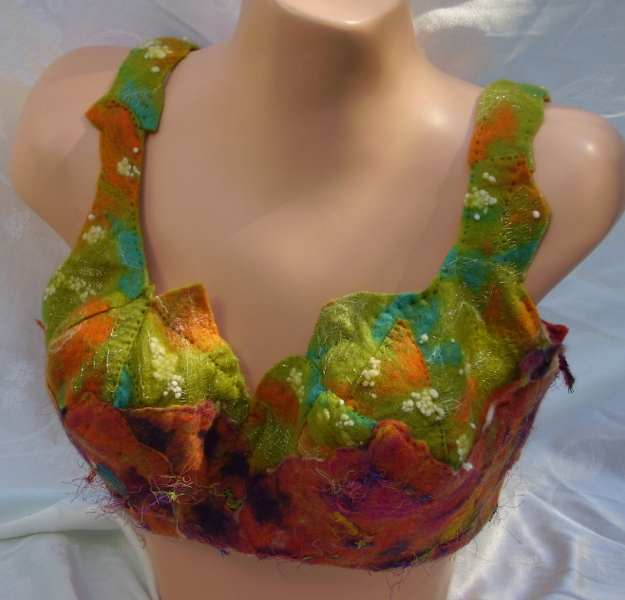 The bra is covered in handmade felt. I have a collection of bras, given to me by friends, for a project	I haven’t started yet. When the ArtBra New Haven fundraiser came along,	it was the perfect opportunity to turn one of them into a piece of	art to raise money. My piece, called Felt Up,	was at first inspired by the medium—felt. Although it was named tongue in cheek, another meaning revealed	itself to me. Women have many kinds of relationships with their breasts. Some are positive, such as sources of pleasure, intimacy, and	nursing. For some, however, there are associations with bad experiences. The expression “felt up” has been used to describe	the manhandling of a woman’s breasts, often in early sexual	experiences; sometimes welcome,sometimes not. So, take this title as it fits your own experience:	playful or fearful, but with the recognition that by buying	this piece of art, you are supporting a victim of breast cancer.